Our winter season pot belly piglets are available and ready to go . five babies to choose from.Set up a date with me so you can have a baby ready when you need it. These are true tiny pot belly piglets. I have five strong, different colours.They­ are wormed, healthy anready to go. I have more information and pictures if you need to know about the true pot belly pigs origin. All parents here at my farm . Teacup Potbellies are small, intelligent, clean and loving, an excellent indoor or outdoor small family pet. 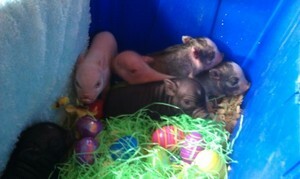 we will prefer personal pickup so you can choose your piglet in person, Serious inquiren please. Have 2months old piglets for sale for R600 each they are well grown, vaccinated very healthy.